Reflecting on the imbalance among women and minorities in the overall tech industry, along with Google’s recent decision to publish their workforce diversity numbers, we at LinkedIn felt that we also wanted to be transparent with regard to our employee demographics. There are currently more than 5,400 LinkedIn employees working in offices from Mountain View to Sao Paulo to Bangalore. Over the past few years, we’ve experienced tremendous growth and have become a truly global company, but in terms of overall diversity, we have some work to do. 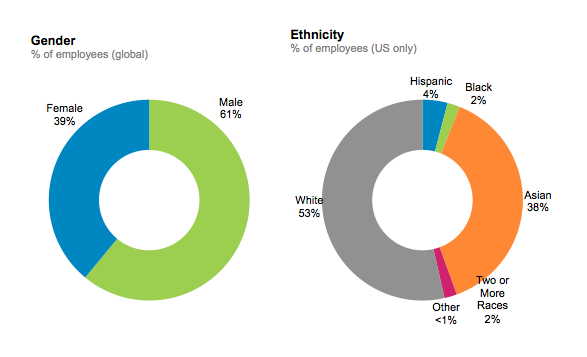 You’ll notice that our gender breakdown is representative of our global employee base, while ethnicity is U.S. only. That’s because legal complexities prohibit us from asking about the ethnicity of employees in many countries outside of the U.S., so accurately reporting that data is not currently possible. Year Up: For the past several years we’ve been partnering with Year Up, an organization that seeks to close the Opportunity Divide by providing urban young adults with the skills, experience, and support that will empower them to reach their potential through professional careers and higher education. Anita Borg Institute: We have an ongoing and growing partnership with the Anita Borg Institute, a world-renowned organization focused on Women in Computing. The organization has been a key partner in our inclusion efforts at LinkedIn, and we are also a sponsor of their annual Grace Hopper Conference. Out & Equal Workplace Advocates: This organization is committed to ending employment discrimination for lesbian, gay, bisexual, and transgender employees. LinkedIn is also a sponsor for the 2014 Out & Equal Workplace Summit, which will take place in San Francisco this fall. Management Leadership for Tomorrow (MLT): We have a deepening relationship with MLT, the premier career development institution that equips high potential African Americans, Hispanics, and Native Americans with the key ingredients—skills, coaching, and door-opening relationships—that unlock their potential. DevelopHer: We are particularly proud of this annual women’s hackday, which LinkedIn created and pioneered several years back. The event is a great way to engage and support women in tech, and we hope to see its impact continue to be felt in the years to come. True inclusion is something that can only be achieved through a workforce that reflects the rich diversity of our member base, and this is something we strive to do in all of our hiring efforts. My role as Vice President of Global Talent affords me the unique opportunity to make a positive change in closing the diversity and skills gaps in today’s workforce. While it’s easy for tech companies, like LinkedIn, to form partnerships with organizations that can promote a more balanced workplace diversity, there is a cycle of responsibility associated with transparency. 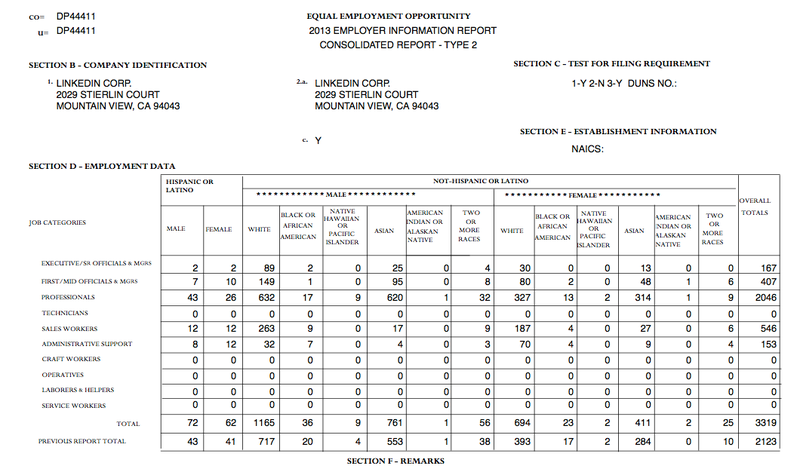 This is why we thought it important to publish our own numbers regarding diversity at LinkedIn - to better ensure this accountability. And we will consistently measure ourselves and look for ways to improve. We may not be the first company to be transparent, and we hope we won’t be the last. Our goal is to improve over time and to make a lasting change at LinkedIn. Let’s challenge each other to make it a more inclusive world in which we work. 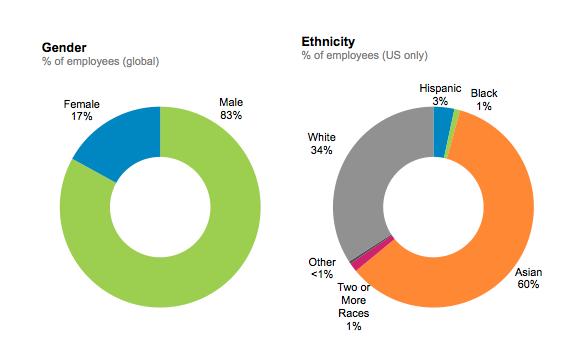 Update: the below charts represent our employee diversity numbers broken out by Tech, Non-tech and Leadership.